At Beresh Pain Management, we treat the following pain conditions. If you have any questions, please contact the office. Arthritis is characterized by inflammation of one or more joints, in its late stages can be crippling. There are many types of arthritis with Osteoarthritis as the most common. As of yet, no cure for exists, however, there are medications, procedures and treatments that can alleviate some of the pain caused by this disease. Osteoarthritis is a condition that is caused by gradual wear-and-tear on the joints. Obesity can be a factor in osteoarthritis, as it causes additional stress to weight-bearing joints in the body, such as the hips and the knees. Rheumatoid arthritis is not caused by deterioration, rather, it is caused by an auto-immune disorder that causes the body to attack its own tissues, which will cause the deterioration common to arthritic disorders. Generally back pain can be attributed to mechanical causes, most of which are relatively benign, although a small number of cases are due to more serious illness. Back pain usually occurs in the lower back, but can occur in the upper back as well. The pain may be aggravated with movement, or may radiate into the upper or lower extremities. Cancer pain can take many forms and is experienced differently by each patient. Many people with cancer eventually experience pain due to their condition. Approximately twenty percent of patients with cancer complain of pain. Thirty percent of patients undergoing cancer treatment complain of pain, and up to ninety percent of those with advanced cancer experience pain. Cancer pain can be sharp and severe, or it can be a dull constant ache. Acute pain alerts you to the presence of injury and is usually limited to less than 90 days. Chronic pain is characterized by pain signals being transmitted and, in many cases, being amplified for weeks, months, and even years. Chronic pain is usually defined as pain lasting longer than six months. Others, including the National Institutes of Health (NIH), define it as pain lasting longer than three months. Still others characterize it as pain persisting longer than reasonably expected for whatever injury is involved. Chronic pain is prevalent and affects about 100 million in the U.S. It can be an enigma due to its complicated natural history, vague etiology, and poor response to treatment. There can be an inciting mishap, an ongoing cause of pain, or an absence of both. Chronic pain is commonly rooted in musculoskeletal, neurologic, urologic, gastrointestinal, or reproductive disorders. It also has associations with psychological disorders such as major depression, conversion disorder, hypochondriasis, and somatization disorder. Common areas for chronic pain are joints, back, head, neck, shoulders, and the pelvis. As we age, our spinal discs break down, or degenerate, which may result in degenerative disc disease in some people. Peripheral neuropathy is the most common type of diabetic neuropathy. It occurs when diabetes damages sensory nerves, which allow the brain to respond to sensations like pain, touch, temperature, and vibration. Peripheral neuropathy may also damage the motor nerves, which work with the muscles to control movement. The effects and symptoms of peripheral neuropathy develop slowly over months or years. The first symptom is usually a slight burning sensation in the affected area. If blood sugar levels remain high over several years, the burning sensation greatly increases and then slowly goes away. It is replaced by a complete lack of feeling and sensation, or numbness, making the person more likely to injure the affected area. Although peripheral neuropathy can develop almost anywhere in the body, it most often affects the feet and legs. Loss of the protective sensationâ€”the reduced ability to feel painâ€”in the feet may lead to the formation of calluses and blisters, bone and joint problems, infection, and foot ulcers. For instance, small, repetitive injuries to the foot, such as those caused by a poorly fitting shoe, may lead to bigger problems simply because the person is unaware of them. Reduced feeling in the feet can also alter a person’s step, leading to bone or joint problems. There are many different types of headaches. Although not all headaches are the same, they all share at least one thing in common — they cause pain. But many headaches also cause other unwanted symptoms, including nausea and vomiting. This article addresses the most common headache symptoms associated with the different types of headaches. A herniated disc occurs when the spongy, soft material that cushions the bones of the spine (vertebrae) slips out of place or becomes damaged. You can have a herniated disc in any part of your spine. When a herniated disc presses on a nerve, it can cause pain, numbness, and weakness in the area of the body where the nerve travels. Follow the links below to find WebMD’s comprehensive coverage about herniated discs, what a herniated disc looks like, how to treat it, and much more. Smooth tissue called cartilage and synovium and a lubricant called synovial fluid cushion the joints so bones do not rub together. But increasing age, injury — even sitting the wrong way or carrying too much weight — can wear and tear your cartilage. This can lead to a reaction that can damage your joints and lead to arthritis. Neck problems and injuries most commonly occur during sports or recreational activities, work-related tasks, motor vehicle accidents or projects around the home. Neck pain may be caused by an injury to one or more of these areas, or it may have another cause. Minor neck injuries may result from tripping, falling a short distance, or excessive twisting of the spine. Severe neck injuries may result from whiplash in a car accident, falls from significant heights, direct blows to the back or the top of the head or sports-related injuries. Osteoarthritis (OA) is caused by aging joints, injury, and obesity. OA symptoms include joint pain and stiffness. Treatment depends on the affected joint, including the hand, wrist, neck, back, knee, and hip, and involves medication and exercise. If you are overweight, weight loss may improve OA symptoms. Osteoarthritis is a disease of the joints. Unlike many other forms of arthritis, such as rheumatoid arthritis and systemic lupus, osteoarthritis does not affect other organs of the body. The most common symptom of osteoarthritis is pain in the affected joints after repetitive use. Joint pain is usually worse later in the day. There can be swelling, warmth, and creaking of the affected joints. Pain and stiffness of the joints can also occur after long periods of inactivity, for example, sitting in a theater. In severe osteoarthritis, complete loss of cartilage causes friction between bones, causing pain at rest or pain with limited motion. Female pelvic pain is pain below a woman’s belly button . It is considered chronic (which means long-lasting) if you have had it for at least 6 months. The type of pain varies from woman to woman. In some women, it is a mild ache that comes and goes. In others, the pain is so steady and severe that it makes it hard to sleep, work, or enjoy life. If your doctor can find what’s causing the pain, treating the cause may make the pain go away. If no cause is found, your doctor can help you find ways to ease the pain and get back your quality of life. Doctors don’t really understand all the things that can cause chronic pelvic pain. So sometimes, even with a lot of testing, the cause remains a mystery. This doesn’t mean that there isn’t a cause or that your pain isn’t real. Phantom limb pain refers to mild to extreme pain felt in the area where a limb has been amputated. Phantom limb sensations usually will disappear or decrease over time; when phantom limb pain continues for more than six months, however, the prognosis for improvement is poor. Although the limb is no longer there, the nerve endings at the site of the amputation continue to send pain signals to the brain that make the brain think the limb is still there. Sometimes, the brain memory of pain is retained and is interpreted as pain, regardless of signals from injured nerves. In addition to pain in the phantom limb, some people experience other sensations such as tingling, cramping, heat, and cold in the portion of the limb that was removed. Any sensation that the limb could have experienced prior to the amputation may be experienced in the amputated phantom limb. Post Herpetic Neuralgia is the persistent, often quality of life altering pain associated with a shingles outbreak. The most disturbing worry for those who have a shingles outbreak is the threat of post herpetic neuralgia. This side effect of shingles is a painful nerve and skin condition caused by the virus herpes zoster. The same virus is responsible for chickenpox in youth and inexplicably causes shingles in some adults. Post-Laminectomy Syndrome (PLS), also known as failed back syndrome, describes a chronic, painful condition that some patients after undergoing back surgery, specifically a laminectomy1. The spine is comprised of bony vertebra stacked upon one another from the pelvis to the skull, which is designed to protect the spinal cord and its associated nerve roots. Each vertebra has an opening in the center which creates a canal for the spinal cord. The lamina is a portion of the vertebrae that connects the spinous process (the protrusions felt on the back through the skin) to the main body of the bone. A laminectomy is a surgical procedure that removes the lamina and any associated bone spurs to relieve pressure on spinal nerves that can occur in a variety of back conditions2. Post-Laminectomy Syndrome is not a diagnosis, but rather a general term to describe a variety of chronic pain syndromes experienced by patients as they emerge from back surgery1. The exact cause of Post-Laminectomy Syndrome is unknown, however one prominent theory points to epidural fibrosis, in which the development of scar tissue during post-surgical healing compresses nearby nerve roots and causes pain. The sacrum is the triangle area below the lumbar spine. The Iliac bone connects to where the hip is. The sacroiliac joint (SI joint) is a large and weight bearing joint. All the weight of the body and upper extremities comes down the spine down the SI joint through the iliac joints and down the legs, so itâ€™s a very important joint. As people age, that joint starts to fuse and some people get arthritis in that joint. SI pain usually feels like low back and buttock type pain. Usually the pain doesnâ€™t radiate below the knee, but in rare occasions it can. Something that is very common is pain on the side of the legs, which is called a bursitis. Whenever a person has pain the body moves just a little bit different than if they didnâ€™t have pain; which is usually the cause of bursitis. This pain can be very severe and radiate from the front or back of the hips and legs. Sciatica is pain originating in the sciatic nerve, which runs from the lower back down the back of your legs. Symptoms of sciatcia include burning in the leg, pain in the back of the leg when sitting, leg weakness, shooting pain, and more. Causes of sciatica may include lumbar spinal stenosis, degenerative disc disease, pregnancy, and other factors. Treatments may include medications, steroid injections, physical therapy, or surgery. Many times, sciatica will ease on its own. Follow the links below to find WebMD’s comprehensive coverage about what causes sciatica, what the sciatic nerve looks like, how to treat sciatica, and much more. Scoliosis is a lateral curvature in the normally straight vertical line of the spine. 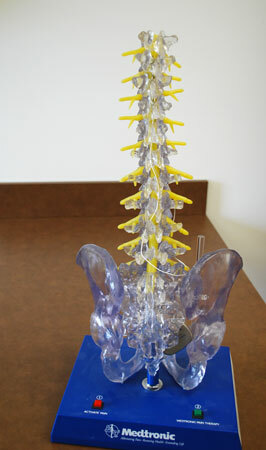 When viewed from the side, the spine shows a mild roundness in the upper back and inward curvature of the lower back. The most common type of scoliosis is idiopathic; it is present at birth and may be inherited. Other types include neuromuscular scoliosis and degenerative scoliosis. Idiopathic scoliosis usually affects those ages 10-16, progressing during the growth years. Some clues that a child may have scoliosis include uneven shoulders, a prominent shoulder blade, uneven waist, or leaning to one side. Diagnosis includes a bone exam and an X-ray to evaluate the magnitude of the curve. Treatment for scoliosis includes back braces, and in more severe cases, surgery that involves joining the vertebrae together permanently (spinal fusion). Follow the links below to find WebMD’s comprehensive coverage of scoliosis, what it looks like, its symptoms, treatment, and much more. Spinal stenosis is the narrowing of spaces in the spine (backbone) which causes pressure on the spinal cord and nerves. About 75% of cases of spinal stenosis occur in the low back (lumbar spine). In most cases, the narrowing of the spine associated with stenosis compresses the nerve root, which can cause pain along the back of the leg. It is important to identify the symptoms of spinal compression fractures and notify your doctor right away. Sudden, severe back pain, especially in older women, may signal a spinal compression fracture or another serious condition. Anyone with significant back pain — especially a woman who is near or over age 50 — should see a doctor. Most compression fractures in women over 50 are due to osteoporosis and treatment can help reduce the chance of further compression fractures.